Home » Books » "The Whole Wide World, Without Limits"
"The Whole Wide World, Without Limits"
Often perceived as being removed from the rough-and-tumble world of male politics, women involved in relief during World War I and the 1920s found themselves grappling daily with questions of ideology, nationalism, and political statehood. Participation in large-scale relief work provided Jewish women with a firm sense of their own capabilities and contributed to their heightened sense of gender consciousness. Their experience provides powerful evidence that women activists in the post-suffrage period sustained a notable degree of separation from men even as they propounded gender equality, thereby facilitating American Jewish women’s entrance into the public realm without their having to sacrifice commitment to either Jewish or women’s issues. Gendered and separatist strategies enabled women to bring their concerns into the public sphere, affect the course of American Jewish history, and shape modern American Jewish identity. 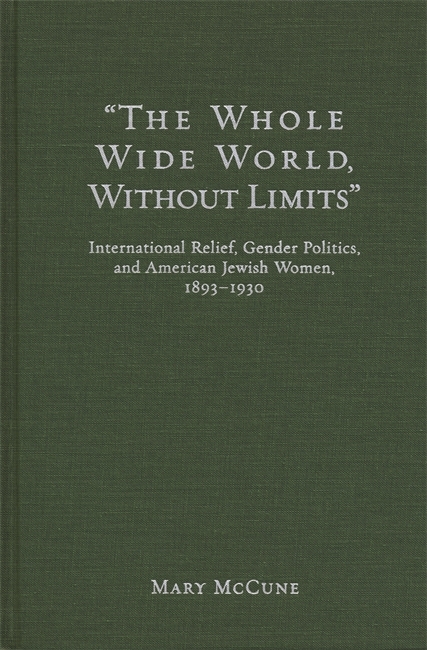 "The Whole Wide World, Without Limits" explores the international relief activities of three American Jewish organizations during this period: the National Council of Jewish Women, Hadassah (the Women’s Zionist Organization of America), and the Workmen’s Circle. Women in all three organizations vigorously raised money for Jews in the war zones and continued to help them after the armistice. Author Mary McCune demonstrates the significance of the work of each group while analyzing the interactions between class, ethnicity, religion, and gender consciousness, both inside the Jewish community and in the broader American context. McCune looks at a wide variety of Jewish women—Zionists and anti-Zionists, religious and secular, capitalists and socialists, wealthy and working-class—and sheds light on the myriad ways that personal identity shapes public activism. More importantly, this book reveals how women’s charity work and their use of gendered strategies exerted influence over seemingly unrelated political events. Mary McCune is assistant professor of history at SUNY Oswego.